During our national search for answers following the Sandy Hook massacre and the United States’ spike in mass shootings, the National Rifle Association contributed this surprising revelation: what schools need most are more guns. Pointing out that deficiency, the NRA demanded armed guards at each of the nation’s 98,000 public schools. But the potential $3 billion annual expense of this has led some to suggest that schools simply arm their own staff members, qualified or not, to police their campuses while performing other duties like teaching. And the gun rights lobbying group’s wisdom hardly ends there. Many of its talking points outline the basis for an educational revolution. Consider how NRA-style schools would run. “Don’t pass gun laws because criminals will simply break them,” these gun lobbyists say. The message is clear: if you can’t correct a problem entirely, don’t try to solve it at all. By this reasoning, schools should not penalize truancy, cheating or fighting. “Gun control is an attack on law-abiding citizens’ rights,” the NRA insists. Likewise, dress codes must be abolished as an assault on young people’s freedom, alcohol should be permitted during lunch and my alma mater should never have eliminated its student smoking section in 1986. “Background checks will create a bureaucratic nightmare,” according to these gun rights proponents. Clearly this indicates schools should end the discriminatory policies of checking students’ grade point averages before naming the honor roll and reviewing transcripts before issuing diplomas. If you let the government dig into your past, what’s to prevent it from creating a national report card database? “Any gun laws, however limited, put the nation on a slippery slope that leads to the government taking your guns away,” the NRA argues. Don’t let the fact that this has never once happened fool you. The threat is real. Look at the way teachers restrict students’ electronics use in class and even confiscate cell phones. Freedom requires an end to this abhorrent practice. In fact, the NRA’s uncompromising belief in the broadest possible rights for gun owners supports an additional conclusion: students also must enjoy the Second Amendment right to “keep and bear arms” in schools. Forget the “well-regulated” part of the tangled sentence and focus only on “the right of the people.” If anyone disagrees, just ask this: what part of “shall not be infringed” don’t you understand? 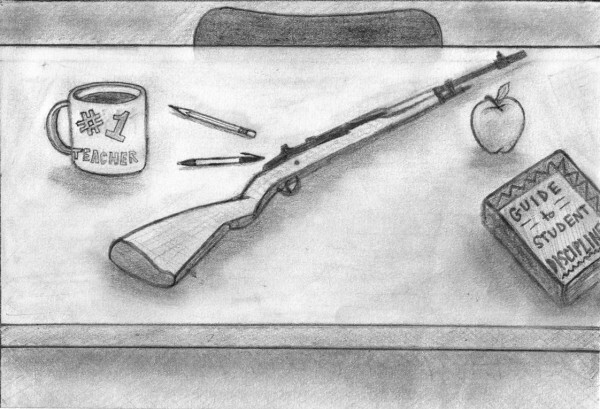 When guns are outlawed in schools, only outlaws will have guns in schools. Besides, kids will love target shooting in physical education and upgrading their semiautomatics in metal shop.